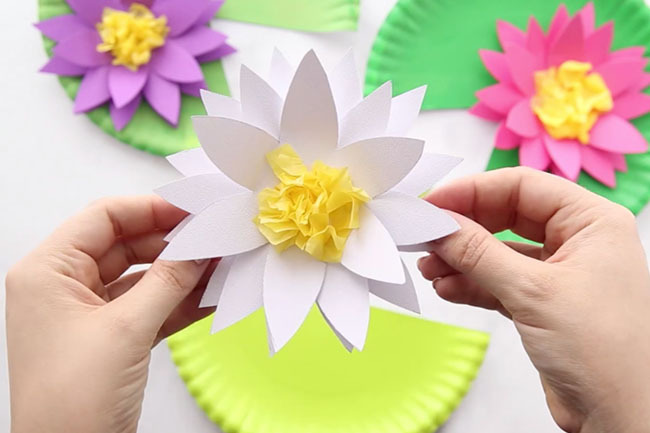 Spring is a perfect time to make paper flowers. 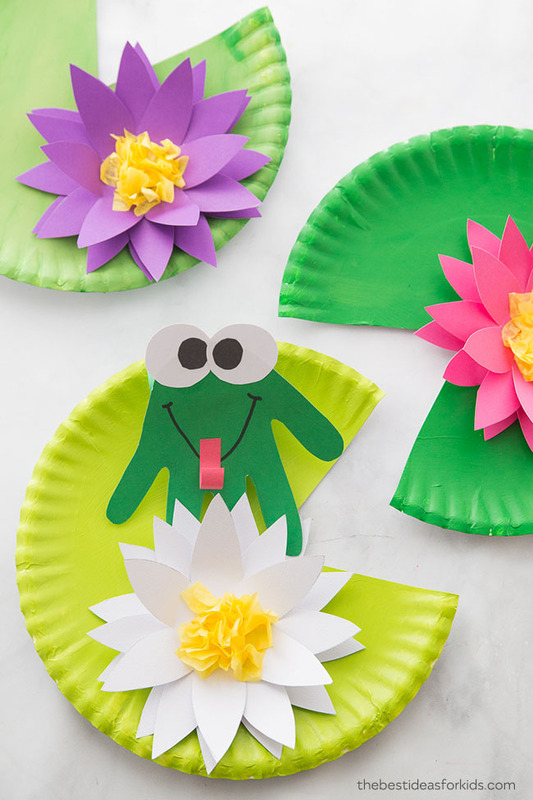 And if you’re looking for an easy spring craft, these frogs, lily pads and water lilies will easily bring spring to life. 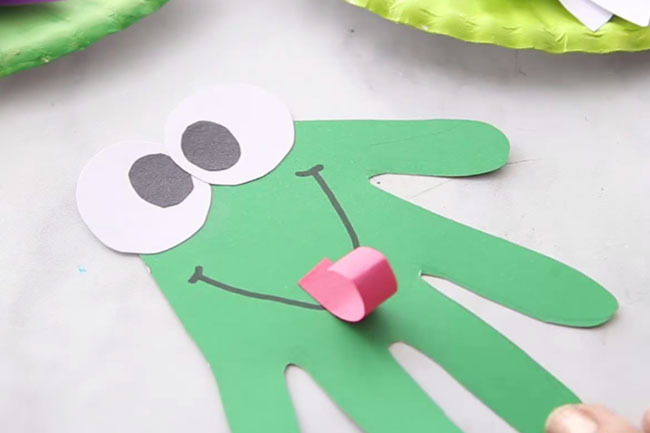 This handprint frog craft is a fun afternoon activity or perfect for a classroom craft. 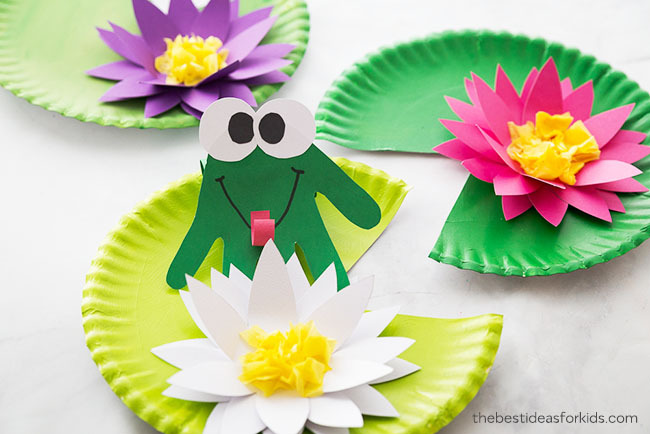 Kids will love making their own handprint frog and bringing it to life on a paper plate lily pad with 3D water lily! 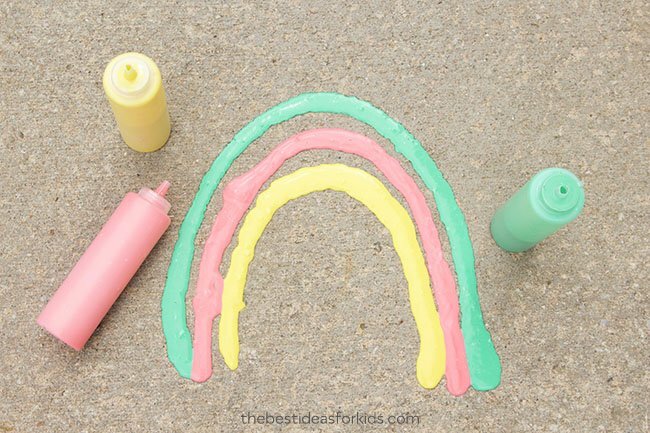 If you’re looking for an easy frog craft – this one is sure to keep the kids busy! 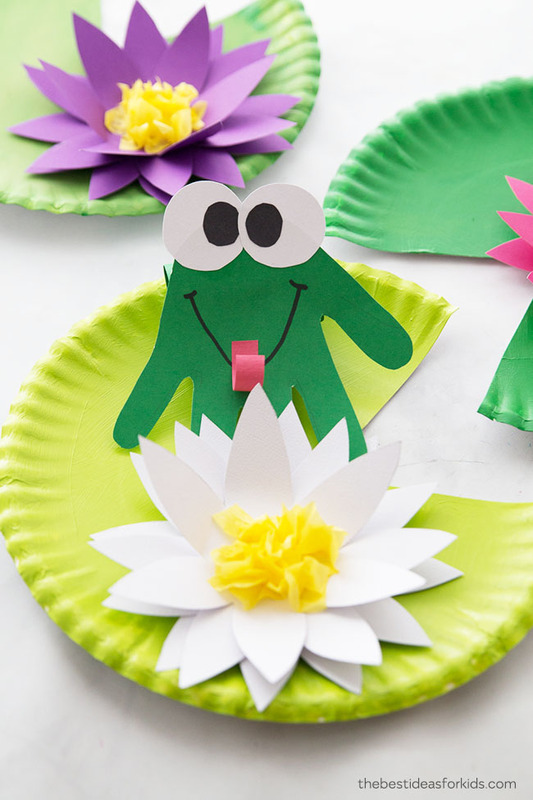 Preschoolers will love making their own frog handprint and putting it on the paper plate lily pad. To make it easier for preschoolers you can cut out one water lily flower and have them color in the middle. 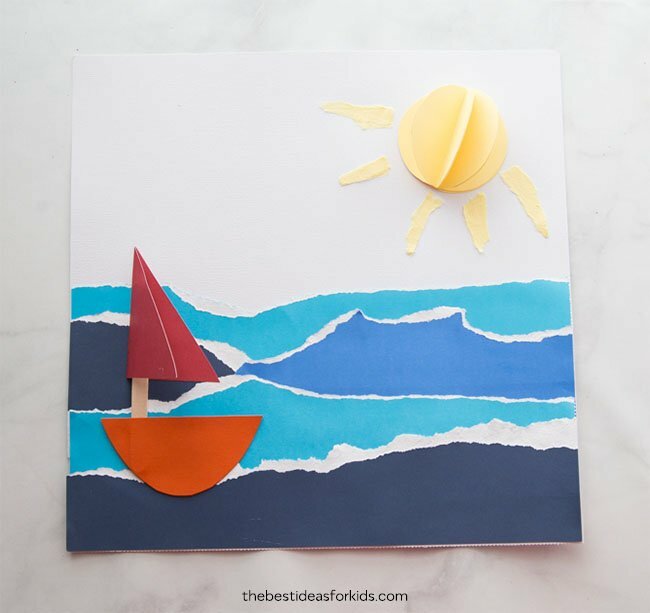 Older kids can make the 3D water lily. For the water lilies – white, purple or pink. For the frog – red, white and black. 1. Cut a shape like a pie piece out of the paper plate to make it look like a lily pad. 2. 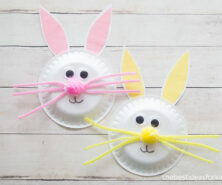 Paint your paper plates. We chose 3 different colors of green. 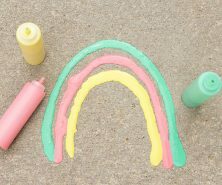 If you plan on using this to display on a spring bulletin board we recommend mixing up the green colors to give the display more interest. The color of the paper plate that the frog is on is called lime tree and it’s a lime green color. 3. Make your water lilies. We made one white, pink and purple flower. 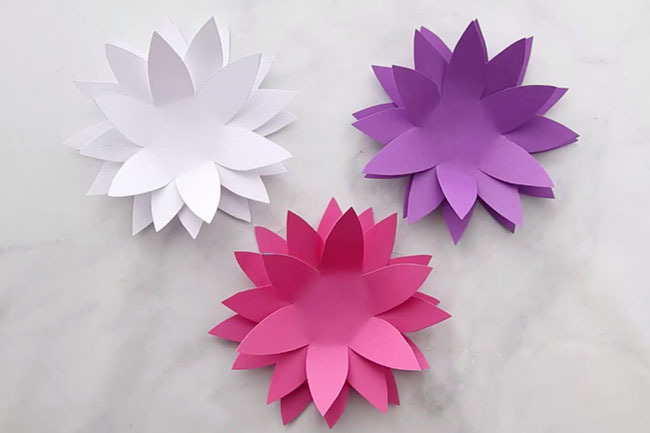 Cut out the template and trace and cut out 4 flowers for each water lily. You can grab the free template at the bottom of this post by subscribing to our newsletter. 4. Glue the 4 flowers together alternating where the petals rest so that it fills the gaps. Bend/crease/pull the petals up on each flower except for the bottom one. 5. Cut out small squares from the yellow tissue paper. Put around the bottom of a pencil and then dip in some glue. Glue down to the center of the flower. 6. Glue the flowers to your lily pads. Now make your frog handprint! 1. Trace your handprint on dark green cardstock. 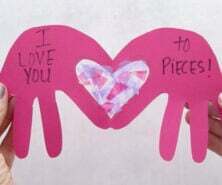 Cut out your handprint. 2. Make your frog eyes. You can trace around a toilet paper roll for the white part on white cardstock. Cut smaller black circles to glue inside the eyes. 3. Glue your eyes onto your frog handprint. 4. Draw the mouth with a black sharpie. 5. Cut out a little strip of red cardstock and curl around a pencil for the tongue and then glue down. 6. Take the same color green paper as the frog and make a loop. Glue or tape the loop together so it looks like a toilet paper roll. Glue down to your lily pad. 7. Glue your handprint frog to the roll on the paper plate so it stands up. Sign up for our Newsletter and get this Water Lily Template as a Thank You!